It's summer time! What's better than heading to the pool or beach with your kids to cool down the summer heat? Before you do that though, make sure you have had all the essentials ready, the life jacket (or PFD - personal flotation device, or life vest) being one of the most important item to be included in your diaper bag. It doesn't matter if you're going to the beach, the local pool, or kayaking, or even just visiting the waterfall, a life jacket is a MUST whenever your kid is near water. Do you know that there are still almost 800 children who drown each year here in the United States? This statistic is staggering and we, as parents, should always be vigilant in ensuring our children have their life vests on around water. 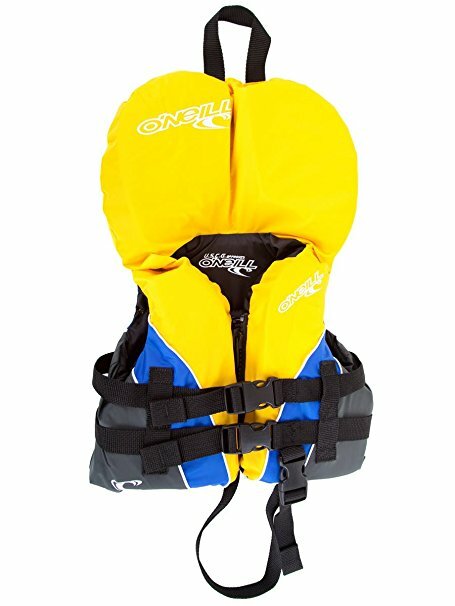 Our review is going to cover both life jackets for infants, as well as life vests for toddlers so that you can find one that best suits your kid's needs. There are quite a handful of life jackets available in the market, but there aren't really that many that works for young infants (we're talking about life jackets for babies under 20 pounds!) so imagine our delight when we come across the Stohlquist Unisex Infant/Toddler PFD, the "best infant life jacket" which quickly becomes our most favourite infant life jacket! Why do we say it is the best infant life vest? In addition to a crotch strap, the Stohlquist also has an additional quick release buckle over its entry zipper for extra security, making it the perfect life jacket for 6 month old and older. Not only that, its flotation device for infants is second to none. Stohlquist's unique wrap-around flotation design makes sure a child is always facing upwards. And if you look carefully, there are actually two layers of support collars to cradle your infant's head, not just for comfort but to keep his/her head above water. If this is not enough assurance, it being a certified Type II PFD with sea level buoyancy of 7lbs 6oz should give you the confidence that this is the best life jacket for newborn. Oh, did we mention also that Stohlquist adds floating beads around the neck collar grab loop for extra flotation? ddition of floating beads around neck collar grab loop. 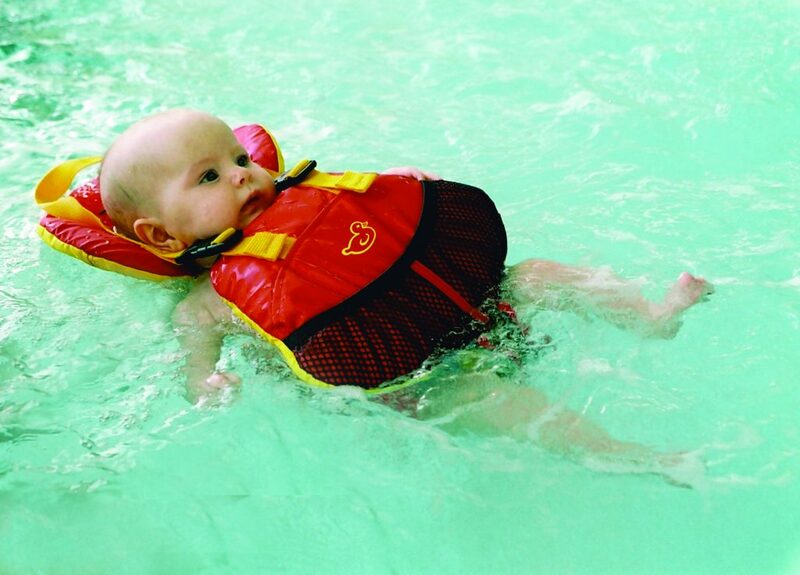 The Stohlquist is also comparably more comfortable than other life vest (there really isn't one that is totally comfortable, lets face it) but a lot of parents reported that their kids are able to stay in one for the whole day without whining, so that's good news! 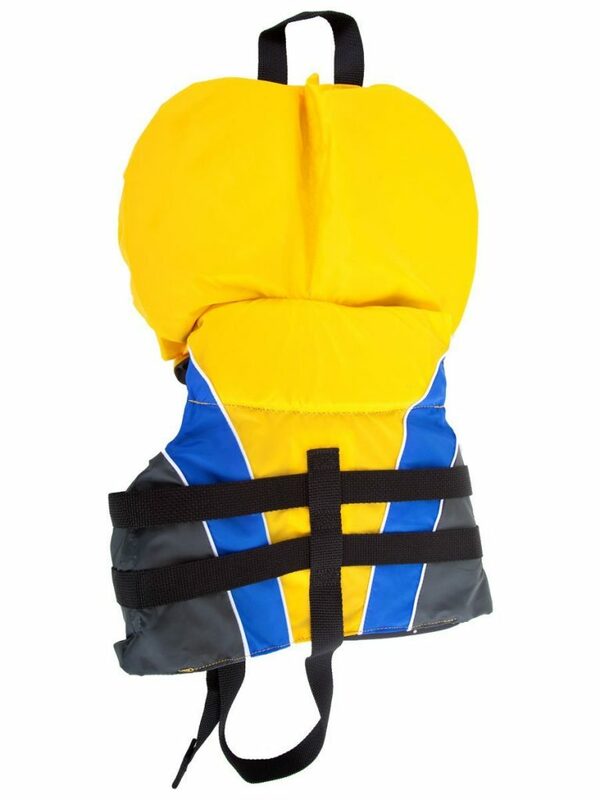 Given that it can support weight up to 30lbs, this can also be the best life vest for toddler. Depends on the size and weight of your toddler, this is hands down the best flotation device for toddlers. 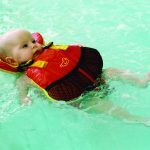 We cannot recommend enough the Stohlquist Infant/Toddler Life Jacket for parents who are on the hunt for the best life jacket for baby (both newborn and toddler). Although it can be pricier than most other brands (but still reasonable and affordable! ), we think it is a great investment that you will not regret. 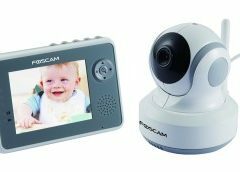 After all, keeping baby safe is your highest priority, isn't it? The O'Neill Wake Waterski Infant USCG Vest is another strong contender in terms of flotation devices for toddlers. Likewise, O'Neill life jacket can also hold up to 30lbs of weight so it makes best as life vests for babies and toddlers. 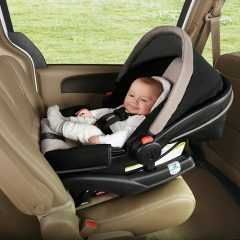 Further, it ups its security level by having two durable Delrin quick release buckles so that you can be assured your child is strapped in well. Compare to Stohlquist, the O'Neill has more padding in that the back of the life jacket is also padded to wrap around your baby. This makes for a good floating device for babies, however, not so much on the swimming department because it forces your kid to always float up. If keeping your child from drowning is your main objective, then this is the best life jackets for kids, in fact, one of the best kayak life jacket! But say, if you want your toddler to learn swimming (while still having the appropriate life safety measure), then it is not the best swim vest for toddler. For that, we recommend getting either the Stohlquist, which is lighter on the padding but still keep your child afloat nonetheless, or one of these. The padding at the back also made it less comfortable for kids compare to the Stohlquist in our opinion, but most parents still find it bearable as their kids are willing to stay in one without much crying or fussing. Being also a Type II PFD and is among the best coast guard approved life jackets for toddlers, the O'Neill Wake Waterski Infant USCG Vest is the one to go for if you are hunting for the best flotation device for toddler. Stearns Infant Classic Series Vest is another hugely popular infant life jacket that fits both infants and toddlers under 20lbs. 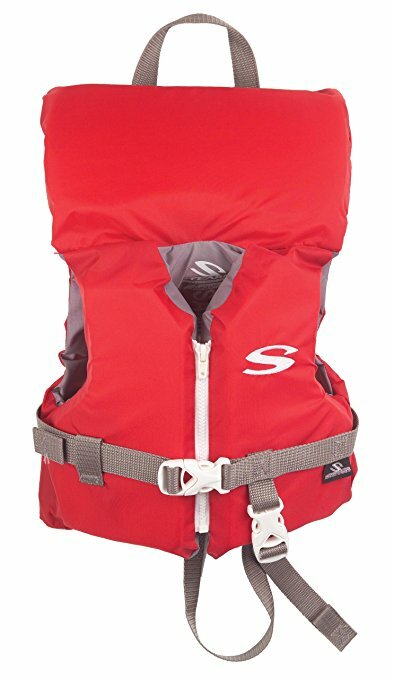 It has all the good features the above 2 contenders have, thus satisfying our best infant life jacket criteria list, and it is by far the cheapest option out of all 3 top rated life jackets here in this review. The catch is, this specific life vest is catered to infant from 0-12 months old only. 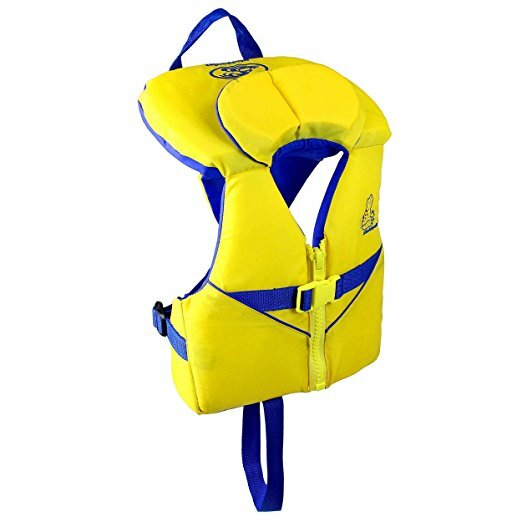 Beyond that, you will need to buy the Child Classic Series Vest if you need a life jacket for 1 year old. The good thing is, the Child Classic Series Vest is even cheaper than the Infant Series, so even if you buy the two together, they will still be slightly cheaper than the Stohlquist and O'Neill. The biggest difference between the Stearns and Stohlquist/O'Neill is that the former's sides are closed up for a better fit. It makes sense actually, as this life vest is advocated for its suitability for even newborns of 0 to 1 month. For Stohlquist and O'Neill, you are advised to wait until your infant reaches at least 4-6 months before putting him/her in the life jacket. Due to the closed sides and wrapped back, the Stearns is the least comfortable life jacket out of all three. So it really depends on when you are using it for - if you are going for a boat ride or beach/pool fun with a newborn, the Stearns is a good choice but if your baby has grown considerably to 6 months or beyond, you may want to consider the Stohlquist or O'Neill. In fact, you can even get one of these (also from Stearns and is deemed one of the best floatation devices for toddlers) for your toddler if s/he is already ready to swim. It is also worthy to note that Stearns has its Adult Classic Series Vest, so it does make for a cute family photoshoot with all your family members wearing matching life jackets if you decide to buy all 3 series! Do you know that there are actually 5 types of Personal Flotation Device (PFD)? 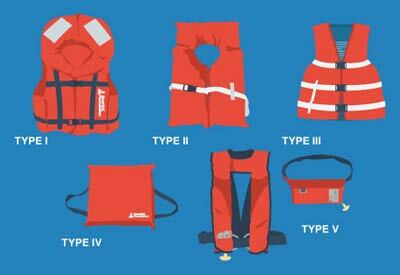 As you can see from the picture above, Type I to III are what we are mostly familiar with in terms of life jacket. What are their differences, you may ask? Type III - for specialised activity such as water skiing, hunting, fishing, canoeing or kayaking, also known as Flotation Aids. For our purpose, Type II PFD is most suitable. They are not as bulky and as expensive as Type I, but they are able to upright even an unconscious person which is what makes it ideal for babies and toddlers. While Type III is also meant for uses closer to the shore, they generally are not able to upright an unconscious person so even though it may be more comfortable for the wearer, it is not suitable for our purpose. All our recommendation in our review above are Type II certified PFDs.